(Nanowerk News) A research team lead by Professor Martin Wegener at the Karlsruhe Institute of Technology (KIT) has succeeded in realizing a new material class through the manufacturing of a stable crystalline metafluid, a pentamode metamaterial. Using new nanostructuring methods, these materials can now be realized for the first time with any conceivable mechanical properties. The researchers will present their results in the cover story of the May issue of Applied Physics Letters ("On the practicability of pentamode mechanical metamaterials"). Pentamode metamaterials almost behave like fluids. Their manufacture opens new possibilities in transformation acoustics. The word penta is derived from ancient Greek and means "five". In the case of water, the five shear parameters equal zero, and only one parameter, compression, differs from that value. In terms of parameters, the ideal state of a pentamode metamaterial corresponds to the state of water, which is why that material is referred to as a metafluid. Theoretically, any conceivable mechanical properties whatsoever can be obtained by varying the relevant parameters. 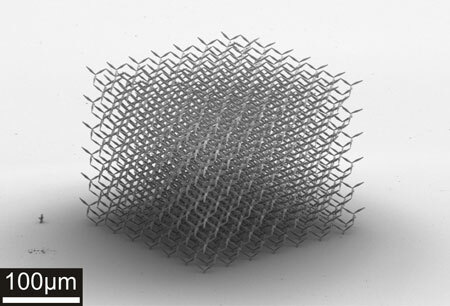 "Realizing a pentamode metamaterial is about as difficult as trying to build a scaffold from pins that must not touch but at their tips," first author Dr. Muamer Kadic explains. "The Karlsruhe prototype has been manufactured from a polymer. The mechanical behavior of the material is determined by the acuteness and length of the individual "sugar loaves". On the one hand, we must be capable of designing small sugar loaves in the nanometer range and connect them to one another at the right angle. On the other hand, the entire structure must eventually become as large as possible. Since the material itself contributes only little more than one percent to the respective volume, the composite obtained is extremely light. 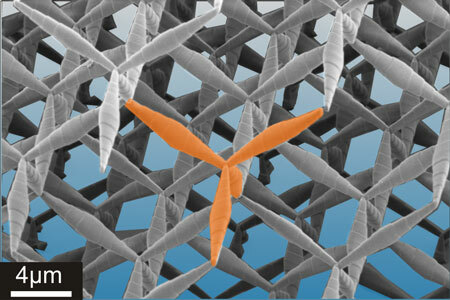 The stable four-leg structure (shown in orange) is the basic element of the pentamode metamaterial. It is arranged in the form of a three-dimensional adamantine crystal such that the resulting material as a whole can be formed. "To obtain similar 3D results, as in transformation optics, transformation acoustics is exclusively dependent on metamaterials. In view of this, this first manufacture of our pentamode metamaterial is a quite significant success," adds Tiemo Bückmann, who is about to receive his diploma at the Institute of Applied Physics and is responsible for realizing the structures of the new material by means of dip-in laser writing, a method that has been derived from direct laser writing developed by the Nanoscribe company. In recent years, a Professor at the Institute of Applied Physics and CFN coordinator, Martin Wegener and his collaborators, have developed direct laser writing and, based on that method, established optical lithography of three-dimensional nanostructures. Numerous achievements of Wegener's group in transformation optics e.g., the first three-dimensional cloak of invisibility in the range of visible light have been due to that technique.